On January 27, 2017, just one week after his first day in office, Trump signed an executive order (Number 13769), titled "Protecting the Nation from Terrorist Attacks by Foreign Nationals", that suspended entry for citizens of seven countries for 90 days: Iraq, Iran, Libya, Somalia, Sudan, Syria, and Yemen, totaling more than 134 million people. The order also stopped the admission of refugees of the Syrian Civil War indefinitely, and the entry of all refugees to the United States for 120 days Refugees who were on their way to the United States when the order was signed were stopped and detained at airports. Since the signing of that document, immigrants have been under a sustained attack, which is not surprising considering our president based his presidential campaign around anti-immigration, America-first, exclusionary rhetoric and promises. Historians, novice or otherwise, need not look far in the past to see a familiar pattern developing---one which starts with the vilifying of a targeted ethnic group, such as Jews (“money grubbing”), Mexicans (“rapists” and “bad hombres”), Muslims (“terrorists”), and the horrifying extreme in which we have already seen it play out. Get Out! transposes the past with the present. It is based on a photo of German Jews being deported from their homeland by SS soldiers in the midst of burning and destroyed buildings—with their hands up in surrender, they march on to an unknown fate. In my version, the SS soldiers are replaced with ICE agents. 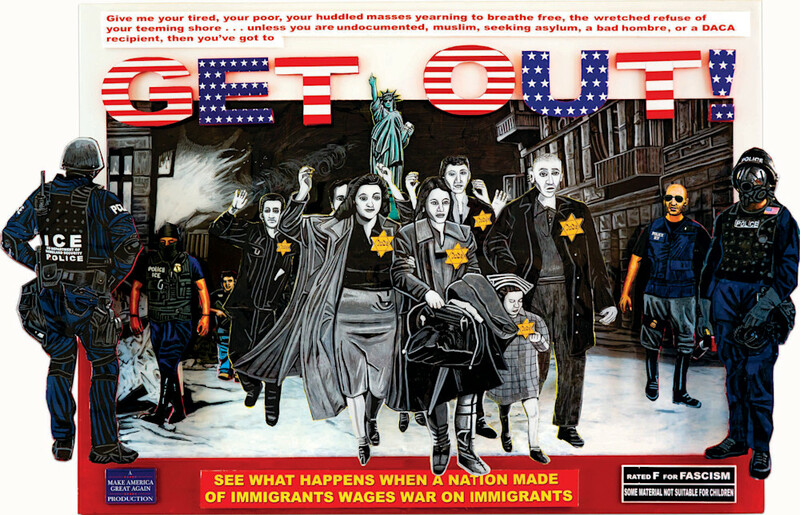 The central image of the deported Jews is kept as close to the original image as I could manage, but enlarged so they are stepping out of the black and white photo and into our present times, where we see history repeating itself. Finally, looming above the doomed men and women is the Statue of Liberty with her middle finger raised high in the sky. While I do make the comparison, I am resolutely not making the statement that ICE agents are Nazis---I will say however, that I believe everyone who was complicit in the annihilation of millions of people during Hitler’s reign believed that by blindly following orders, no matter how gruesome, they were just doing their job—whether that is wrong or right is for you to decide.